As LeBron James and Rajon Rondo continue to slowly make their way back to the court, Lonzo Ball is trying to fill the massive leadership void left for the Los Angeles Lakers. 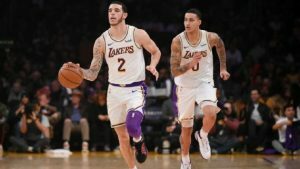 Nowhere near as vocal as James, Rondo and veteran center Tyson Chandler, Ball wants to try to lead by example first and then be vocal when needed. Ball — who is averaging 9.5 points, 5.3 rebounds and 5.2 assists while shooting 32.7 percent from 3-point range this season — was asked if there is another player he has seen who leads more by example and isn’t as vocal. The Lakers (23-21) have struggled in going 3-7 since James (groin) and Rondo (hand) were both injured on Christmas Day in a win over the Golden State Warriors. They’ve dropped their past two games, including a 101-95 defeat at home to Cleveland, which had lost 12 in a row. Rondo — who was cleared to begin dribbling and working with his right hand, on which he had surgery on Dec. 28 to repair a ligament in his ring finger — has been trying to mentor Ball and bring out more emotion in him. Earlier this season, Ball said Rondo would accomplish that by talking trash to him in practices and getting the younger point guard to play angrier. Rondo also would organize players-only film sessions.